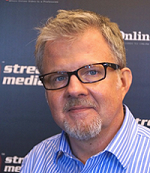 As the programming for this year’s National Association of Broadcasters show unfolded, those of us in the online-video world couldn’t help but be disappointed at the dearth of pertinent content. For all the talk about the convergence between TV and the internet (see Geoff Daily’s "It’s Not Your Father’s TV, Part Two," pp. 60–69), the largest assembly of traditional broadcasters in the U.S. seemed content to treat online video as an annoying upstart rather than an exploding business and technology phenomenon. So imagine our surprise when both Adobe and Microsoft made huge announcements at the show. Adobe unveiled its Adobe Media Player, a standalone video player that enables DRM for Flash Video for the first time, while Microsoft introduced Silverlight, a cross-platform, cross-browser media and application delivery plugin. In the process, each company tried to shore up its real and perceived weaknesses. The lack of DRM has long been considered Flash Video’s Achilles’ heel, and the fact that Flash was tethered to the browser meant that it couldn’t compete in the download and mobile markets. As for Microsoft, the lack of support for Windows Media Player on the Macintosh—despite Redmond’s official endorsement of Telestream's Flip4Mac—has hurt its reputation among the creative community and, to a lesser extent, consumers. But both of these announcements do more than just fill in the holes in each company’s offerings. Adobe and Microsoft are both aggressively trying to capture more mind- and market share, and both the Adobe Media Player and Silverlight—as significant as they are on their own—are outgrowths of even more significant shifts in each company’s online media strategy. For Microsoft, it means acknowledging that it had dropped the ball regarding the importance of video, and making video central to its online strategy. "Visual media is now a first-class citizen across the entire company," says Sean Alexander, director of the video platform, server, and tools division at Microsoft. "We’re admitting that we kind of screwed up. We didn’t have true cross-platform support and interactivity. We’re now going after that very aggressively." For Adobe, it’s the first time the company has untethered Flash from the browser and made its playback environment free of licensing fees, hoping to grow the player’s penetration via ad-supported content. "We’ve gotten tremendous response to Adobe Media Player because it’s ad-supported, and there’s an existing inventory of so many ads already in Flash," says Craig Barberich, group product manager in Adobe’s Dynamic Media Organization. "We’re not trying to be in the middle of the ad business. We’re just trying to provide solutions so that other companies can build out their content." Which technology will have a bigger effect on the online video industry is open to debate and, of course, it will be a long time before the dust settles. As tempting as it is to turn this into the clash of the video titans, this isn’t a zero-sum game. "I’m a big believer that a rising tide lifts all boats, and I think all of the R&D expense on the part of both Adobe and Microsoft will benefit the entire space," says Tim Napoleon, media and entertainment product line director at Akamai, which is a Microsoft Silverlight partner and has long been a Flash Video Streaming Server partner. Limelight co-founder and chief strategy officer Mike Gordon is equally sanguine about Silverlight and Adobe Media Player. "By themselves, [they] won’t necessarily change the online video landscape," he says. "But these products mean more tools and more choices for developers. Competition is always good; it drives innovation and progress, and the competition between Microsoft and Adobe is no different." Let’s take a look at both technologies as well as what some industry leaders are saying about them.